What Is a Fabric's Crosswise Grain? The crosswise grain of a piece of fabric is a term that describes the threads that run perpendicular to the length of fabric as it comes off the bolt, the rectangular piece of cardboard that quilting fabric is wrapped around. 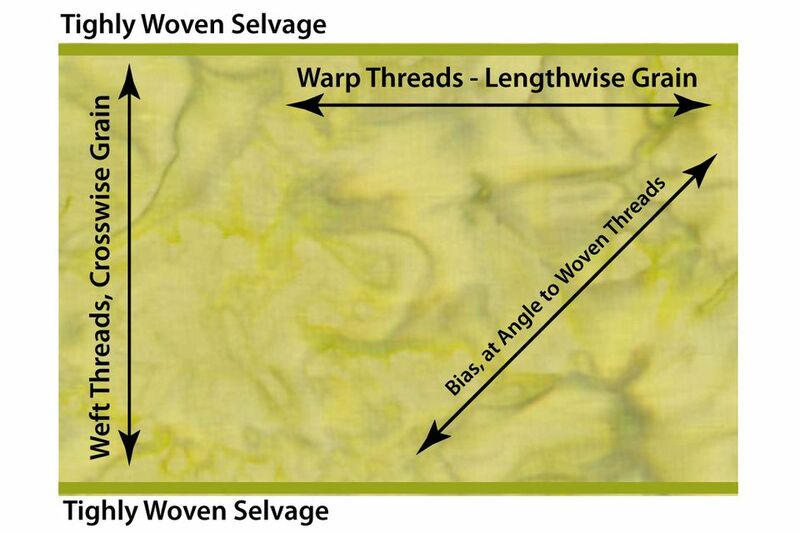 In other words, crosswise grain flows across the yardage from selvage to selvage. Fabric's crosswise grain is made up of the weft threads, which are threads that are woven back and forth along the lengthwise grain. The crosswise grain is also called the straight grain or straight of grain. Fabrics have many properties, but there are a few terms that quilters hear about most often. Lengthwise grain is made up of warp threads. The warp threads are secured to both ends of the loom and remain stable during the weaving process. There are more warp threads per square inch than weft threads (crosswise grain threads) and that's one reason the lengthwise grain is less stretchy than the crosswise grain. Like the crosswise grain, the lengthwise grain is also referred to as straight grain or straight of grain. Crosswise grain, explained above, is stable, but just a bit more stretchy than the lengthwise grain. A fabric's bias technically lies at a 45-degree angle to the straight grains, but quilters refer to any off-grain cut as a bias cut. A fabric's selvage is the tightly woven area at each side of the crosswise grain. Selvage is created when the weft threads make a turn as they are woven in the opposite direction along the fabric's length. The back and forth weaving motion continues along the entire length of fabric. Learn more about fabric grain and some of the grain abbreviations you'll see when you read quilt patterns. Most patches have straight grain edges that are cut along both the lengthwise and crosswise grains. Each straight grain is stable, but the slight stretch of the crosswise grain is especially helpful for some tasks. Crosswise grain binding strips are perfect when you want to sew binding to quilts with straight sides. The crosswise grain threads are not always as straight as threads in the lengthwise grain. If a thread in the binding becomes worn and breaks, it won't (typically) create a split along the entire length of the binding (something you do need to worry about when you use lengthwise grain binding strips). You can reserve bias binding strips for quilts with curves, where more stretch is needed. Crosswise grain strips of fabric can be a good choice for quilt borders. The strips do need to be pieced together for large quilts, but using crosswise strips requires less yardage. We've never had an issue with too much stretch in crosswise grain borders, but some quilters prefer to use lengthwise grain strips. Experiment to see which works best for your needs.